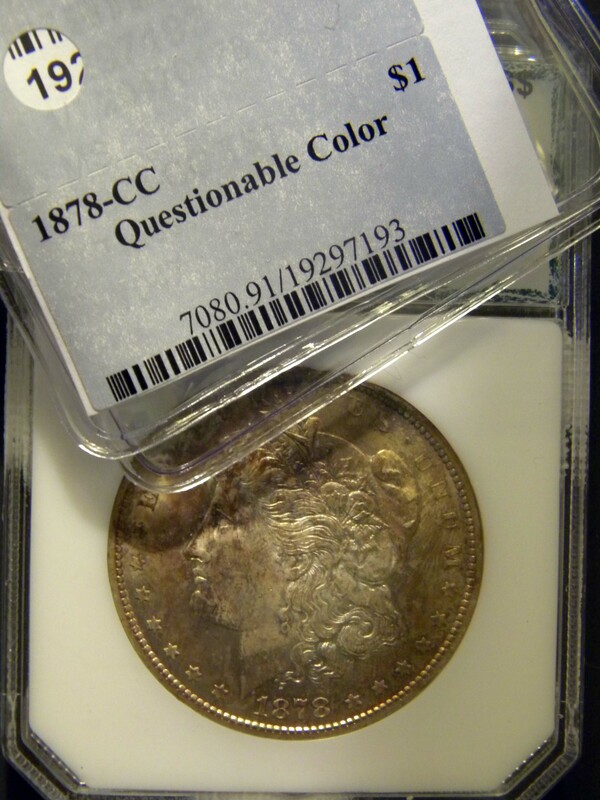 Many Proxibid auctioneers disavow knowledge of coin grading and condition. Better to claim ignorance than to exaggerate worth, as a few houses do. Increasingly, however, expert numismatists are writing lot descriptions with their best estimates of grade and condition. Silver Trades, which schedules regular coin auctions on Proxibid, provides detailed lot descriptions replete with information about history, grade and condition of lots. On certain quality coins, the company also backs up descriptions with buyback guarantees. I do my best to estimate the grade/condition of the coins, but please note, unless specifically mentioned in the description, I do not guarantee grade or condition. I DO ALWAYS GUARANTEE 100% AUTHENTICITY, on an immediate buyback including any premium paid. But please understand, if you win a coin and receive it and send it out to one of the grading companies and it comes back graded less than I estimated or “genuine but Ungradeable”, we will not buy back that coin. … I do my best to give you my best estimate and your repeat attendance at my auctions is what I strive for, so I always attempt to give my best description/estimate of the coins being auctioned. Silver Trades is known for numismatic information. We featured that once in this post. On some coins, however, Sliver Trades owner Corey does offer buyback guarantees and recently enhanced that to buybacks within 1 point of any major slabbing company’s grade. Silver Trades augments lot descriptions with fine photography. We applaud him and encourage bidders reading this to view one of his auctions live to hear expert salesmanship as well as numismatic data. However, to illustrate how difficult it is to anticipate grades of the most rigorous company, PCGS, you should read this article in Coin Update News. If you don’t know numismatics, don’t hype coins as rare. Provide the very best pictures possible of obverse and reverse and ensure that they expand sufficiently for finer details. Don’t use the online PCGS or NGC databases to describe a coin’s retail worth unless that coin is holdered by that company. Treat as raw all coins holdered by lower-tier and self-slabbing companies. (Note: Top-tier companies, in addition to PCGS and NGC, are ANACS and ICG). If you know numismatics, or have hired someone to help with lot descriptions, include a disclaimer as Silver Trades does that you are providing your best estimate on grade and condition and cannot accept buybacks when grading companies assign lower grades. If you want to showcase your numismatic knowledge, see how Corey does it on select lots in his auctions, which typically bring him added premiums often above retail–a credit to him as one of our favorite auctioneers. If bidders complain after the fact about a grade, and you did not exaggerate or misrepresent the coin, do as dealers might, and remind him or her about your disclaimer. If the person is a regular customer, a dealer might make an exception and take back the coin; however, this is a gray area that you must decide. Indeed, grading is subjective to a large degree. To learn how to write better lot descriptions of grade and condition, study our posts in the Boos and Booyahs section of Proxiblog. Once you establish a reputation for good lot descriptions, you can count on more bidders frequenting your Proxibid sessions. This entry was posted in Articles, Best Practices, Featured Updates and tagged American Numismatic Association, ANACS, Auctioneers, Best Practices, Coin Auction, coin grading, coin photography, ICG, iCollector, National Auctioneer Association, NGC, PCGS, Proxibid, Proxiblog, Silver Trades. Bookmark the permalink.